This is pretty fascinating, if not also very chilling (h/t Stacy Trasancos). It seem to us that that, that the fact that the medical profession, at one time, had adopted the Hippocratic Oath does not weight upon the fundamental constitutional rights involved. I take it, from what you just said, that you’re—you didn’t even footnote it because it’s old. Mrs. Weddington: Well, I guess you…it is old, and not that it’s out of date, but it seemed to us that it was not pertinent to the argument we were making. 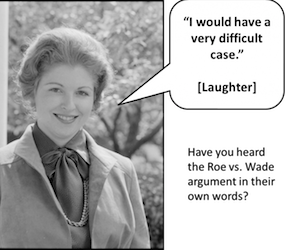 Mrs. Weddington: I think had there been established that the fetus was a person under the Fourteenth Amendment or under constitutional protection then there might be a differentiation. Mrs. Weddington: It depends on saying that the woman has a fundament constitutional right and that the state has not proved any compelling interest for regulation in the area. Mrs. Weddington: No, Your Honor. Chief Justice Warren E. Burger: Could Texas constitutionally…did you want to respond further to Justice Stewart?